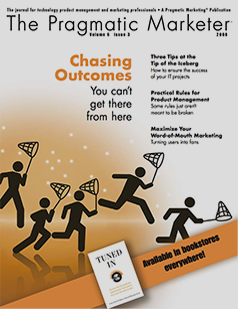 Chasing Outcomes: You Can't Get There from Here, Three Tips at the Tip of the Iceberg: How to Ensure the Success of Your IT Project, Practical Rules for Product Management: Some Rules Just Aren't Meant to be Broken (Part 1), Maximize Your Word-of-Mouth Marketing: Turning Users into Fans. 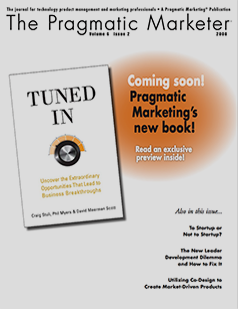 Why Didn't We Think of That?, To Startup or Not to Startup?, The New Leader Development Dilemma and How to Fix It, Utilizing Co-Design to Create Market-Driven Products. 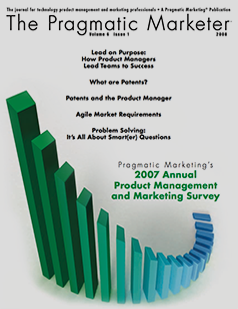 Pragmatic Institute's 2007 Annual Product Management and Marketing Survey, Lead on Purpose: How Product Managers Lead Teams to Success, What are Patents?, Patents and the Product Manager, Agile Market Requirements, Problem Solving: It's All About Smart(er) Questions. 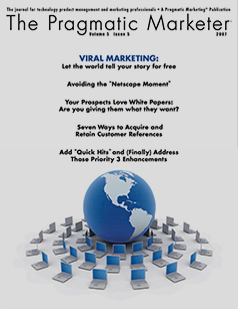 Viral Marketing: Let the World Tell Your Story for Free, Avoiding the "Netscape Moment", Your Prospects Love White Papers: Are You Giving Them What They Want?, Seven Ways to Acquire and Retain Customer References, Add "Quick Hits" and (Finally) Address Those Priority 3 Enhancements. 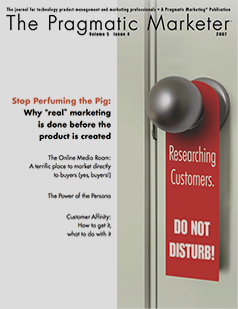 Stop Perfuming the Pig: Why "Real" Marketing is Done Before the Product is Created, The Online Media Room: A Terrific Place to Market Directly to Buyers (Yes, Buyers! 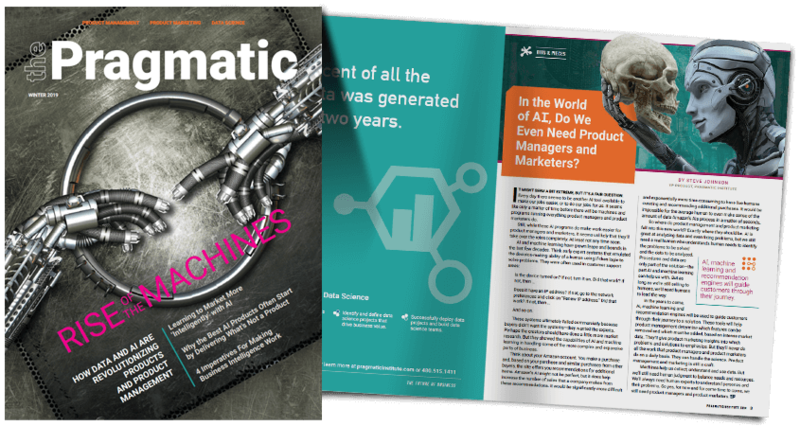 ), The Power of the Persona, Customer Affinity: How to Get It, What to Do With It. 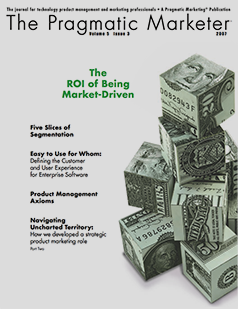 The ROI of Being Market-Driven, Five Slides of Segmentation, Easy to Use for Whom: Defining the Customer and User Experience for Enterprise Software, Product Management Axioms, Navigating Uncharted Territory: How We Developed a Strategic Product Marketing Role (Part 2). 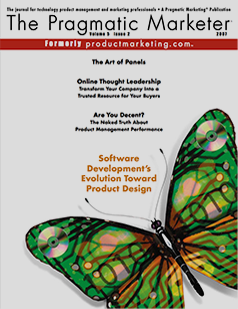 Software Development's Evolution Toward Product Design, The Art of Panels, Online Thought-Leadership: Transform Your Company into a Trusted Resource for Your Buyers, Are You Decent? The Naked Truth About Product Management Performance. 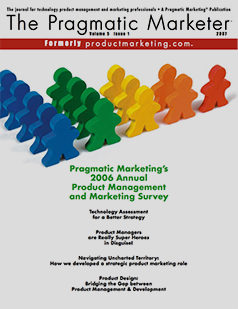 Pragmatic Institute's 2006 Annual Product Management and Marketing Survey, Technology Assessment for a Better Strategy, Product Managers are Really Super Heroes in Disguise, Navigating Uncharted Territory: How We Developed a Strategic Product Marketing Role, Product Design: Bridging the Gap Between Product Management and Development. 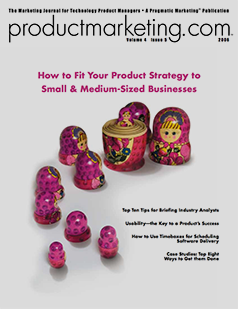 What's the Difference Between Product Management and Product Marketing?, How to Fit Your Product Strategy to Small & Medium-Sized Businesses, Top Ten Tips for Briefing Industry Analysts, Usability - the Key to a Product's Success, How to Use Timeboxes for Scheduling Software Delivery, Case Studies: Top Eight Ways to Get them Done.